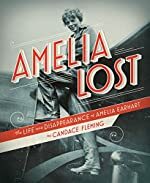 Amelia Lost: The Life and Disappearance of Amelia Earhart by Candace Fleming. Review: On the day of July, 24, 1897 a hidden miracle happened. Amelia Earhart was born. A history maker, a time stopper, and a phenomenon were what made up the brave Amelia. There was one problem though, no one knew that. All they saw was a cute little baby. In the book titled Amelia Lost it tells of her brave accomplishments. The author Candace Fleming explains who Amelia Earhart really was, a brave woman. She tells of the funny times and the bad times of Amelia. However there has always been one question to be solved, what happened to Amelia Earhart? If you were to live with Amelia in her childhood you would say that she was a boy. Obviously she was not. Still people thought she was. A good example is when in the winter at her grandmother's house instead of using one of the girl sleds she used the metal boy sleds. That almost made her spoiled because she just asked for one and she got it. Then, when she got home to her parents house one year she got a .22 rifle. Her mother was terrified but her dad said it was fine. With that gun she shot rabbits, squirrels, rats, birds, and all the small game she could find. From then on she became independent, smart, and eventually an adult. In her teens she started to think more of what she wanted to be. One day she saw an airplane and said she wanted to become a pilot. Not one person believed in her. None of that let her down. One day she said she was going to fly around the world. That year Amelia did. Her Family her friends and most of all her crew were all waiting for her. Overall Amelia's crew was the most important because they were responsible for filling her gas tank up. The head of the crew Chief Leo Bellarts kept trying to contact Amelia. But, every time he tried there was no response. When worst came to worst he gave up. Amelia Earhart was gone. Amelia Lost is a stupendous book. Personally the best books I have ever read. One great part was when they were trying to find her because it was full of suspense. I thought they were going to find her but I knew no one would. An amazing part was when they kept talking about how small the boat was where Amelia had to fill her tank up but how no one could see something so small, even the most skillful pilots. Out of five stars I rate this book with five stars and that is because most non-fiction books sound like textbooks but this one never did. In fact, it actually feels like you are Amelia sometimes. Also, I say this because I really like books like that because it helps the reader to keep reading not stray away to another book. It is a great book for readers ten and up. Mainly because you need to have to have a lot of background knowledge of Amelia Earhart. In the end it is a very inspiring book. If you have not read Amelia Lost you are missing out on a lot. We would like to thank Random House for providing a copy of Amelia Lost: The Life and Disappearance of Amelia Earhart for this review. Have you read Amelia Lost: The Life and Disappearance of Amelia Earhart? How would you rate it?